I thought it was very telling this past week that the President of the United States thought it necessary to further fortify himself against the people he serves by putting spikes on the posts around the people’s White House. On a daily basis, we in America are inundated with the magnification of the crimes that are committed by the despots who are supposed to represent us (Numbers 32:23). Yet, if he were serving in the manner that he should be serving, he, like the presidents of the past, could actually walk up and down the streets shaking the hands of those he represents without fear of reprisal. It is becoming more apparent in this country that the people are sick and tired of being sick and tired. They are becoming more resolute in the lawful action that they would like taken concerning the crimes of this administration. Without a doubt, the tone is definitely changing. But why are we here? Often, I have to ask myself how it is that a population of 315 million people can stand back or stand down in the face a small group of corrupt individuals who mean to destroy the country in which we live. History has taught us that many of these small groups of corrupt people actually get away with it, at least for a short while. In America, the president only becomes tyrannical through deception when those he serves are rebels to their own principles (Hosea 4:6). After all, the history of tyrants occurs when a people are disobedient toward God. So, why has America allowed all of the evil? 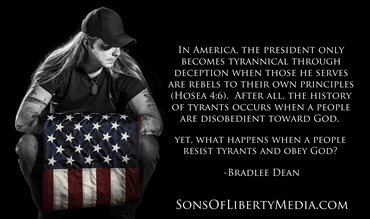 But what happens when people obey God and resist the tyrant? Take a look around. Two hundred and thirty-nine years later we are all here to tell others about it. Resolved, That these United Colonies are, and of right to be, free and independent States, that they are absolved from all allegiance to the British Crown, and that all political connection between them and the State of Great Britain is, and ought to be, totally dissolved. That it is expedient forthwith to take the most effectual measures for forming foreign Alliances. That a plan of confederation be prepared and transmitted to the respective Colonies for their consideration and approbation. Thomas Jefferson, John Adams, Benjamin Franklin, Roger Sherman and Robert Livingston were all on the committee assigned to draft the text of the Declaration. Moses standing on the Shore, and extending his Hand over the Sea, thereby causing the same to overwhelm Pharaoh who is sitting in an open Chariot, a Crown on his Head and a Sword in his Hand. Rays from a Pillar of Fire in the Clouds reaching to Moses, to express that he acts by Command of the Deity. "Motto, Rebellion to Tyrants is Obedience to God." "Mr. Jefferson proposed: The children of Israel in the wilderness, led by a pillar of cloud by day, and a pillar of fire by night, and on the other side Hengist and Horsa, the Saxon chiefs, from whom we claim the honour of being descended and whose political principles and form of government we have assumed." More often than not, we hear about how if we do not learn from history, then history will repeat itself as a negative rather than as a positive. Therefore, I conclude that when it comes to what our forefathers have established, it is one portion of history which we want to repeat.